Three best friends, Buta, Kishan and Neza, from a village near Lahore, are in their twenties and friends for life. There is immense bonding and selfless love amongst each other, which also includes their respective families who have all been living in a great harmony for ages.Life takes a beautiful turn when Naseebo enters Buta's life during his sister's marriage. Kishan and Neza help Buta and Naseebo find true love, however tragedy soon strikes in the middle of the night during celebrations, when Partition is announced. 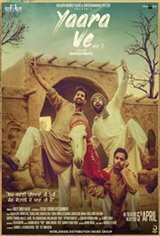 Hindus and Sikhs of the Village, now in Pakistan, have no choice but to leave for Amritsar in India.YAARE VE is one such story of how the true friends will prove their friendship amidst the religious chaos and ensuing violence.